Twenty five million pounds of nitrogen from human waste made their way to the bays through Suffolk County’s groundwater last year, says Stony Brook researcher Christopher Gobler, causing ever more frequent and long-lasting algae blooms that are causing serious harm to our marine ecosystem. Dr. Gobler is just one member of a new consortium of concerned scientists, environmentalists, public policy activists and educators who have joined forces this year to form the Long Island Clean Water Partnership to advocate for the health of both the island’s groundwater and its bays. The partnership held a forum with the appetizing title of “Toxic Tides and Pesticides and Sewage, Oh My!” at Farmingdale State College Monday night, urging public participation in a cause that is gaining momentum island-wide. But many of the people who came to talk had distinctly East End roots. Dr. Gobler said the map actually needs to be updated because the rust tide in the Peconic Bay spread as far east as East Hampton this summer. He said that, along most of the south shore bays and in the Peconic Bay along the South Fork, most of the nitrogen has been proven to come from human waste in groundwater, but on the North Fork, a significant amount still comes from agricultural fertilizers. Not only does nitrogen lead to the growth of algae blooms, it also causes the roots of salt marsh grasses to get lazy and not grow as strong as they would have if the nitrogen wasn’t so readily available. The salt marsh grasses then begin to break off into the water. He said nitrogen also causes the growth of seaweed and other macroalgae on the surface of the water, which shades out eelgrass beds, another important habitat for the bays’ shellfish and young finfish. Suffolk County has about 350,000 individual septic systems and cesspools. As a longtime rural county, it historically hadn’t had to face the large populations that in the past necessitated sewer systems in western Long Island. The Suffolk County Health Department has begun to approve alternative on-site denitirification treatment, but Bob DeLuca of the Group for the East End said at the forum that the work is going slowly, in part due to budget cuts. He said the health department needs to finish its Comprehensive Water Resources Management Plan, which has been in draft form for more than two years. The Nature Conservancy’s government policy director, Kevin McDonald, likened the problem with Suffolk County’s cesspools to the automobile industry’s initial reluctance to put catalytic converters on cars 40 years ago. He said it would take engineers, creative financing and government support to fix Suffolk County’s septic mess. Richard Amper of the Long Island Pine Barrens Society agreed. “Nobody would let you flush away on the Croton Reservoir,” he said. Adrienne Esposito, whose group, Citizens Campaign for the Environment, helped organize the forum, issued a challenge to participants. The full livestream of the conference is available here. Thank you for that excellent report! 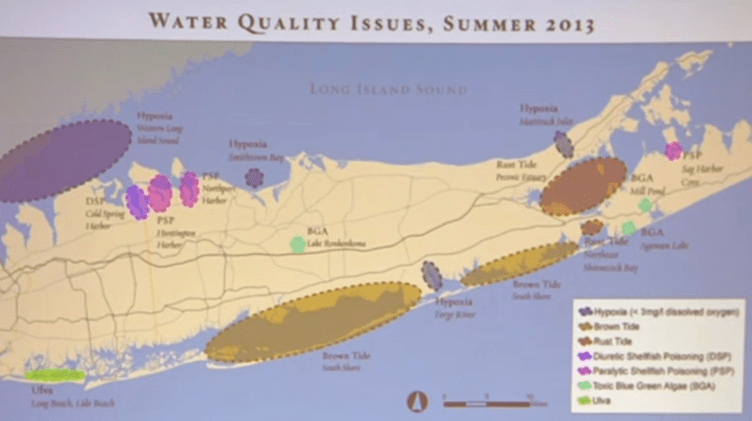 As a steering member of the Accabonac Protection Committee in East Hampton, I’ve been working on our annual newsletter and I came across this article on the forum about water, waste, etc. I would love to be able to use an excerpt from this for our newsletter. We are totally grassroots, non-profit, etc. Have been working on issues related to the health of the Accabonac creek environment for over 25 years, work closely with Bob Deluca at GEE, the Nature Conservancy, etc. Please let me know who to contact about quoting you! And thanks again…glad to have found East End Beacon!